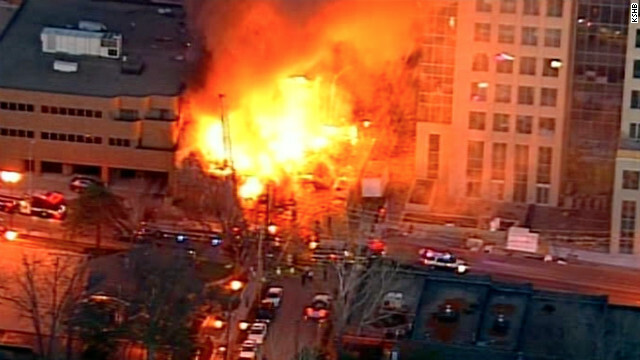 Fire rages after a gas explosion February 19 in downtown Kansas City, Missouri. Six employees of JJ's restaurant in Kansas City, Missouri, have filed a lawsuit against five companies and one person in connection with the February 19 natural gas explosion that killed one woman. The workers filed suit Monday in circuit court in Jackson County, naming Missouri Gas Energy, excavating contractor Heartland Midwest, Time Warner Cable (an independent company no longer owned by CNN parent Time Warner), two other businesses and one individual as defendants. Filed under: Courts • Justice • Lawsuit • Missouri • U.S.
Was there ever any doubt that this was going to occur?